Rock Newman Show » Rock Newman Returns to Radio! Rock Newman Returns to Radio! Watch Rock Newman Show LIVE! 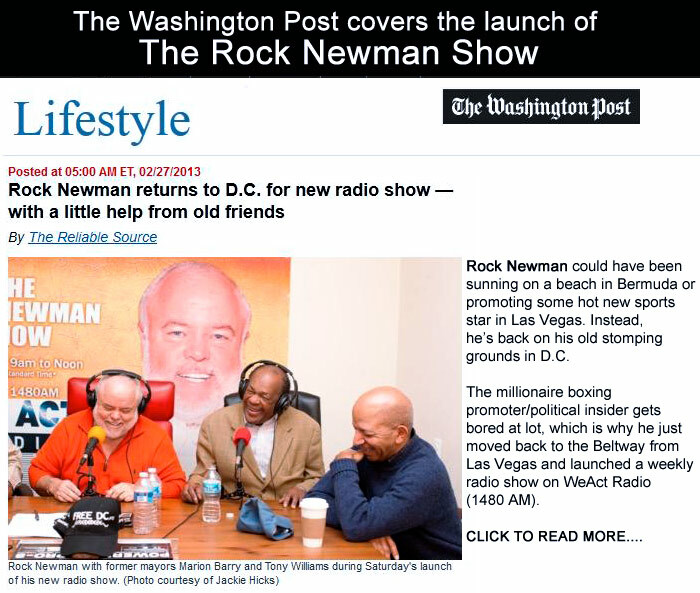 Anacostia-based Radio Station (WPWC 1480 AM) welcomes Washington DC’s Rock Newman on Saturday February 23 at 9AM for a Homecoming Birthday Breakfast Broadcast that will feature a high profile lineup of local and national celebrities. Whatever words are used, Rock Newman is never described as anything less than engaging, sincere, energetic and caring. Rock Newman returns to the Washington DC region with vast experiences and relationships to revisit his roots in radio. 2013 will see Newman add a new media recipe to his broadcasts, which include streaming video and worldwide online discussion.